I feel like a member of our family just made the big time! 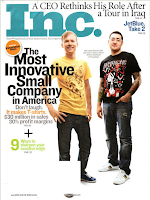 Threadless - a Chicago-based crowdsourcing Tee Shirt company, about which I have written often and to which we owe a great deal of inspiration - just made the cover of the June issue of Inc. Magazine. One of my top favorite rags, Inc., has done a fine job covering the ins and outs of the Threadless innovation. Working between emotive quotes from academics like Eric von Hippel (May 4 and May 8 blogs) and Karim Lakhani, an esteemed Local Motors advisor, the article profiles Jake Nickell, the original Threadless founder, and gives wing to the essential crowdsourcing innovation of the business. Though somewhat lengthy, I cannot recommend highly enough a read through this article. Anyone who considers themselves a student of the Web 2.0 movement, or even just a regular user of Wikipedia, will find this subject enlightening. 2) Threadless (at least according to the article) did not originally rely on expert designers in their mix to get the community off of the ground. (Though I doubt the veracity of this claim) We will (and have) certainly relied on the input of "ringers" on our community to elevate the dialogue of car design. I think that talented designers are both necessary and emboldening, and they themselves get a lot out of the interaction. As discussed last night, it is a two-way street. 3) Threadless is making tees which are much simpler in every way than making cars. To this observation, I propose the following trade off. It might be 1000x's more difficult to design a car, but it also is a 1000x's more thrilling when it is done. 4) Threadless undoubtedly made an innovation in business, but I question the impact they have made beyond the improved quality of tee shirts and the implied return for the investors. I know that, to some, this comparison is heresy, but to me, I daresay, that LM is meaningful for not only the above reasons, but because it also impacts local jobs of a higher skill, a tightly integrated supply chain driven by the discipline of Just in Time, service with a direct feedback loop to manufacturing and design, parts with an ecosystem of education on how to install, range of fuel choices, and maximum flexibility to transportation ideas "at the pace of the customer demand shifts". Though many of these observations generate additional questions, they by no means predict that Threadless is any less or more successful in its idea. They merely provide a departure point from which to compare different business models. Bravo Threadless, and welcome to a permanent increase in Web 2.0 enabled service and product companies. You have given all of us much up to which we must measure.